These are just a few of the amenities available at Meadow Villas. The Out Post is a luxurious bedroom which features a new queen-sized bed and pillow-top mattress, game table with two leather chairs, large closet and a TV for watching videos or game playing. This unit has it's own outside, ground-level entrance. Through an innovative building design, Out Post can be rented as the 'third' bedroom for Serenity or a 'second' bedroom for Quiet Waters, but is not available separately. When stepping into Quiet Waters, take a deep breath and leave your cares behind. It is an inviting, ground-floor, one bedroom villa with a combined dining/living room area that also includes a comfortable sleep sofa and cozy Lazy Boy recliner. It has a gas fireplace and a soothing, indoor waterfall feature also offering a private bedroom with queen-sized bed and full bath. 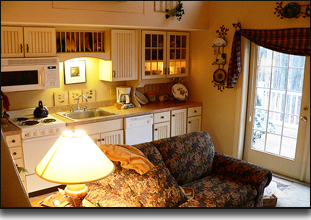 The galley kitchen includes a full-sized electric stove, refrigerator & microwave. When requested as 2 BR, Quiet Waters includes the Out Post bedroom. The glass doors of Quiet Waters open to the sound of a mountain stream meandering through the backyard and great views of forest with mountain meadows beyond. It is the most private and secluded of the Meadow Villas. The furnished patio invites you to enjoy a morning cup of coffee in the fresh mountain air. The Tree House is a two-level, spacious loft unit with a private deck off the main level (kitchen, dining, living room area). Large windows create an expansive view of the forest and mountains. Climb up into the luxurious bedroom suite that hosts a pillow-topped, queen sized, four poster bed, hand-painted chest of drawers and full sized writer’s desk with brocade chair. The adjacent bathroom has a deep soaking tub and shower combination with stone-tile flooring. Open the loft windows and listen for the gently flowing waters of the nearby mountain stream. 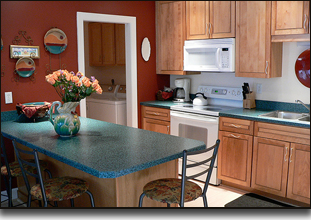 The following amenities are included: fully stocked kitchen including microwave, dishwasher, apartment sized refrigerator with freezer, TV/DVD, free wireless Internet, CD/tape player, sofa bed, high-end bedding, extra towel sets and available laundry facilities for extended stays. We recommend Tree House for a couple’s special occasion celebration. 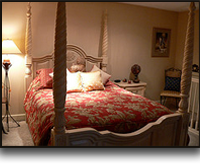 (This Villa has been described by some guests as the “love nest”.) 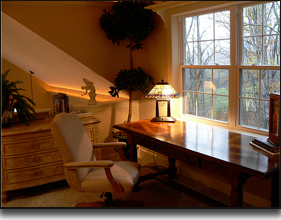 It is also perfect for a quiet retreat without interruptions or to be creative - for writing, studying, for sabbatical stays and spiritual retreats. Consider giving a gift certificate to an anniversary couple, honeymoon couple, a pastor, friends you'd like to bless or even your boss. Serenity is the perfect choice for those seeking luxurious, spacious getaway accommodations at an affordable price. It's multiple decks, sunroom and writer's loft are spectacular and inviting. It features a large kitchen and full-sized side by side refrigerator freezer, microwave and a full kitchen; well prepared to host parties, family gatherings or group meetings. 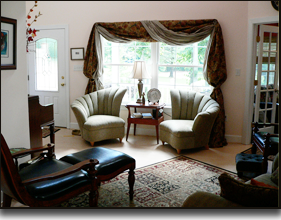 The sun room includes new, overstuffed patio furniture, a fireplace and TV/DVD with DirecTV service. There is a great room with kitchen bar and stools, dining table seating six, and comfortable, luxurious living room with sofa bed and a piano. 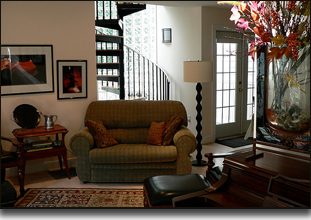 Climb the spiral steps to a loft area that offers a writing table, new full-sized futon, large bathroom with a tub/shower combination and sky-light, along with a private boudoir-styled master bedroom. Bedding and extra towel sets provided. Serenity has multiple private decks, (one upstairs off of the writer's nook) providing additional outdoor seating with deck tables and chairs. The bedroom on the main level has two single beds and bathroom with a tub/shower combination with ceramic tile and glass tile floor. The purified air and hardwood floors are especially refreshing to those who may suffer from allergies or poor city air quality in their hometown. Although Serenity has the largest floor space, it's quite cozy and occasionally available at a special one-bedroom rate. With the sleeper sofa and futon, the unit can accommodate seven people…or nine+ if rented as a three bedroom with the Out Post. 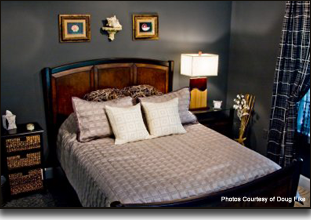 Consider renting Serenity for an overnight business or church leadership retreat. 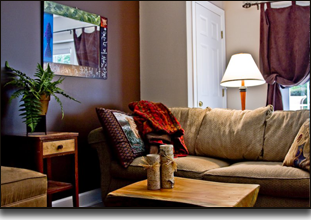 It is a wonderful villa for both long-term rental opportunities or just as a weekend Virginia mountain getaway. 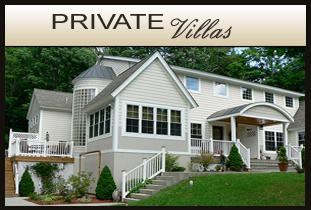 Villa Complex for Group Gatherings & Vacations - Consider Meadow Villas!